The fourth Stardom Cinderella Tournament was a night filled with fun matches, a little drama, and a very interesting result. 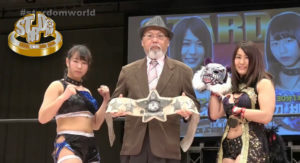 Three title were put on the line (only one being a Stardom title) during an entertaining show in Osaka. This smaller Stardom show in Osaka featured two first round matches for the ROH Women of Honor Title Tournament as well as some pretty good tag matches. Momo Watanabe challenges the leader of Queen’s Quest, Io Shirai, in a match to prove herself. Also, Oedo Tai puts their tag titles up against Tam Nakano and Mayu Iwatani, and Toni Storm takes on the legendary Meiko Satomura in a good Korakuen Hall show for Stardom. Queen’s Quest battles Queen’s Quest in a tag match and Oedo Tai faces a trio including their former teammate Tam Nakano in a good show from Stardom. Io Shirai defends her Wonder of Stardom Title against Shimmer champ Nicole Savoy in a very good Stardom show emanating from the beautiful KBS Hall in Kyoto, Japan. Tam Nakano begins her journey outside of Oedo Tai while her former teammates battle Queen’s Quest for the Artist of Stardom Titles! Oedo Tai and Queen’s Quest finally battle five-on-five, and one team member will be forced to leave their faction. Rachael Ellering challenges Io Shirai for the Wonder of Stardom title and Oedo Tai faces a team of competitors from overseas, including Shimmer Champ Nicole Savoy, in a good Stardom show from Yokohama. Queen’s Quest and Oedo Tai battle in a pair of good singles matches on their way to Korakuen Hall later this month. 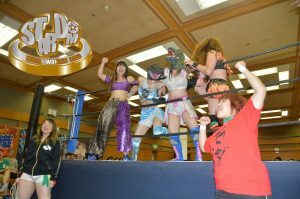 Queen’s Quest challenges Oego Tai for the Goddess of Stardom Titles in a great main event to a very good Stardom show. Stardom starts of 2018 with a good show and sets up an interesting tag match for Korakuen Hall later in January. Mayu Iwatani takes on her first challenger for the World of Stardom Title as she battles Yoko Bito in a night of very good matches at Korakuen Hall! The focus of tonight’s Stardom show at Shinkiba 1st Ring seemed to be to set up the upcoming Korakuen Hall show, but it managed to have some pretty good matches as well. Team Jungle competes in two big tag matches in Jungle Kyona’s hometown, and Oedo Tai attempts to divide and conquer Gabby Ortiz and Shanna in two singles matches in a very good Stardom show coming out of Nagoya! 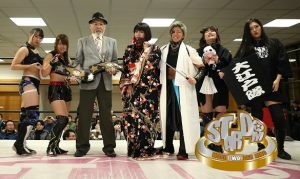 This was an okay Stardom show. While it didn’t feel particularly important, it featured two good tag matches: Oedo Tai vs Queen’s Quest and Team Jungle vs B.I. Ho. Stardom takes over Korakuen Hall with two big title matches: Oedo Tai challenges Team Jungle for the Goddess of Stardom titles and Mayu Iwatani gets another shot at Io Shirai’s World of Stardom championship! Queen’s Quest puts their Artist of Stardom Titles on the line against Team Jungle in a nice Stardom show which also featuring the Stardom debut of Women of Honor’s Gabby Ortiz! Mayu Iwatani puts her Wonder of Stardom Title on the line against Hana Kimura, and HZK tests her abilities against Io Shirai in a nice night of action from Stardom!